I spent weeks researching for the best restaurants in Shanghai and Hong Kong. Since I was traveling thousands of miles across the world, I wanted to make sure that I didn’t waste any meal on some mediocre representation of Hong Kong/Shanghai cuisine. I spend countless nightlights Googling “Shanghai food,” “Soup Dumplings,” “Dim Sum,” “Won Ton”, “Egg Tarts,” etc, reading blog upon blog entries and writing countless emails asking for recommendation, in order to create the final list of must eat foods. Although, the bags under my eyes were well worth the great meals I had eaten, but as it turned out, my favorite meal in Shanghai was not found on the Internet. Instead, I found this nameless Lanzhou la mian (handmade noodles) restaurant in a quiet neighborhood near People Square and Nanjing Lu, with a storefront that most westerners will never step foot in unless dragged into by a local Shanghainese resident. This shop is not about ambiance. If the LA county health department inspected this restaurant, they would never give it a rating higher than a “C.” You will find great food at this restaurant, but risk staying up all night with the runs. Throughout the trip, I passed by many similar street food vendors who could have served the most authentic and amazing food in Shanghai, but because of my western snobbery, I was too scared and missed out. Although, la mian is not a Shanghainese cuisine, but since it is a local favorite, I thank my expat Shanghai resident tour guide for taking me to eat amazing Lanzhou la mian. We ordered two la mian dishes that was made right in front of us. 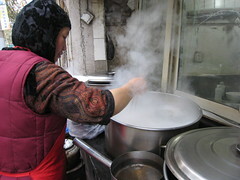 The noodle maker started with a lump of dough. Then by stretching this dough, it became long, thin strands of tasty noodles. Amazing! 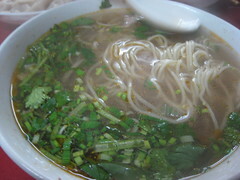 La Mian Soup (tangmian) - Hand-made noodles served with a flavorful, spicy, clear beef broth. 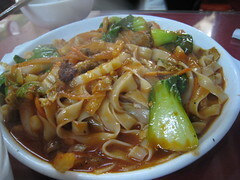 La Mian Stir-Fried (chaomian) - This was my favorite dish. Soft yet chewy wider noodles served with a spicy, flavorful tomato based sauce with beef and seasoned vegetables. It was the best noodles I have eaten. Dumplings – Pork dumplings. They were okay, but the star was definitely the la mian. Sometimes you don’t need to do research to find the best local cuisine. Just go where the locals are and it will find you. I am looking for a restaurant that serves authentic lamian and found your blog. I am really happy to have found your write-up. The only thing is I am not from the LA area and need more specific direction. How do I find this hidden gem? An address would do. Thanks. The work is very versatile, with so many concentrations intermingling.I am really happy to have found your write-up. Just wish to point out that you couldn't possibly have pork dumplings in a lanzhou la mian eatery - because those people are usually Muslims. 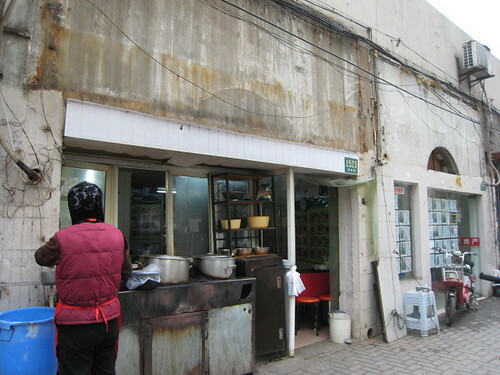 Otherwise I love lanzhou la mian too.